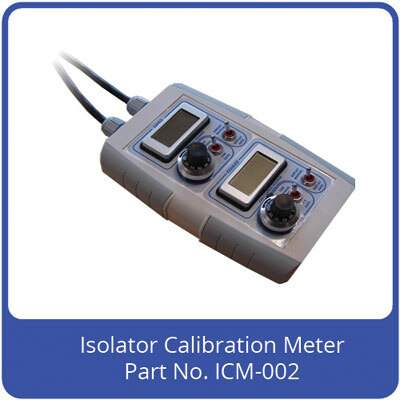 What is the Isolator Calibration Meter ? The QAT isolator control systems control automatically by modulating the speed signal to both supply and exhaust fans. This is switchable from PWM (pulse width modulated) to 0-10 VDC analogue. For nearly all isolators, 1-10 VDC analogue controlled fans are used. This is mainly because PWM is generally reserved for use with the smaller gas blower type fans as in the PCI and AMU. For certain test and diagnostic work it can be useful to send a manual control signal to the fans. As this is not provided for in the control system, this piece of equipment does just that. The Isolator Calibration Meter plugs into the circuit board fan connection terminals between the board and the fan. It takes the constant 24 VDC signal available from the terminal and passes this through a 23 turn potentiometer in the meter. This modulated signal is then passed to the fan as its DC analogue control signal in place of the automatically generated signal available from the terminal middle contact.